This intrepid Radical deputised a couple of chaps (known to our dear readers from other beer related forays such as, er… beer festivals) and set off to deepest, darkest, Kentshire for the start of a micro pub crawl that would take us from Crayford to Eltham via Welling and Blackfen. The relatively new phenomenon sees entrepreneurial types (or just beer lovers) converting vacant shops in to small pubs. The focus is very much on good quality real ale sourced direct from breweries – no pubcos, no disappointingly generic selection of too cold, too fizzy, hipster ‘craft beer’. Some may find the concept a little intimidating or a bit ‘old man’ – yes, most seem to have a no mobile phone policy, but that is mainly because the pubs are very small and as we all know from the Wants to Look Very Important Person Who Has To Talk Loudly On Their Mobile Phone On The Train, this can be irritating in confined spaces – but the owners and staff are very friendly and if you like ale or want to try good ale, fancy a quiet pint etc. these are good places to go. Your Radical had time to ponder these issues as he looked out on the green fields on the short train journey from Lewisham to Crayford. The Penny Farthing, a short walk from the station was the first stop. We took a perch by the window and realised that by chance we had turned up during their beer festival so had a choice of 7 ales (along with a selection of wines and ciders). Table service is offered but as it was pretty busy we deployed the newly learnt skill of loitering by the beer board (not every micro pub has a bar!) and then settled down to three good pints (Peerless Red Pocks, Slaters Rye IPA, Cottage Starlight IPA). We then moved on to the Great Newsome, Moles, and Arundel Castle. The Slaters Rye topped the scores. On to a bus (25mins) for Welling and The Door Hinge, which is situated near the football ground. As well as the front bar (pretty lively for mid-afternoon) there is a snug in the back with sofas and a fireplace. A smaller selection of ales – most tend to have four or five on the go – but we managed both Rockin Robins on offer (equal first), the Titanic, and Southwark. 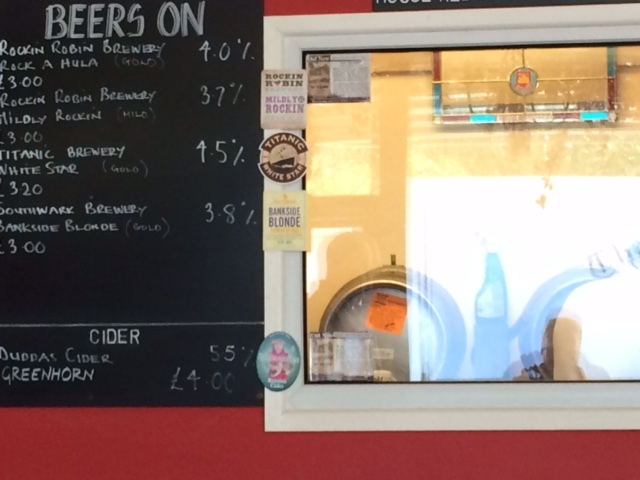 As with the other micro pubs The Door Hinge offers a window on the beer casks. A brewery tour recently initiated your Radical on the difference between cask and keg, and without being a bore… Cask is on the hand pump, keg is on the tap and is kept colder and more pressurized. What difference? the deputies (and I’m sure you) ask. Well, the short walk and bus journey to the Broken Drum in Blackfen enabled your Radical to go into beer bore mode. Quite a bit is the answer. The temperature and fizz makes a big difference. In short, the hipster friendly fruity American style pale ales are better suited to the tap which is why you will see the now ubiquitous Camden and Meantime Pales on the tap. Cold and fizzy provides a big but short flavour hit whereas warmer (12C rather than 8C if memory serves correctly) allows a more complex flavour to develop as you drink the pint. If you get an opportunity to try the same beer from both cask and keg you’ll see – pubs generally don’t as they’ll buy one beer for the pump and a different one for the tap but a brewery bar sometimes does. 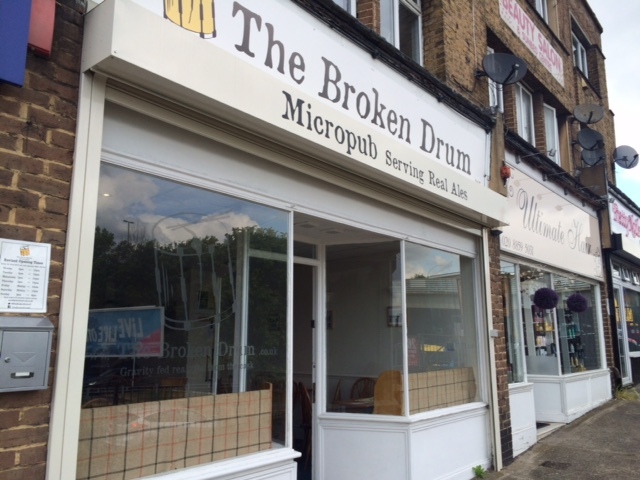 The Broken Drum is only about 10mins from The Door Hinge by foot and bus. Open for only a couple of months we gather it was doing a decent trade. Unlike the other two it was less like a traditional pub inside, instead opting for simple white décor. 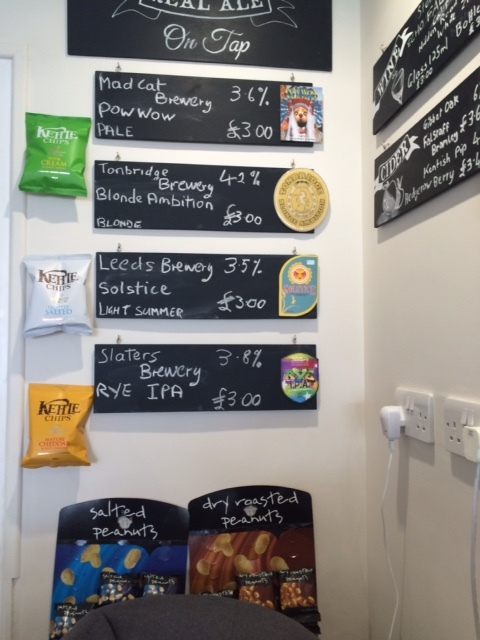 Once again we found the Slaters, which bested the Madcat, Tonbridge, and Leeds beers on offer. You may have noticed that between three of us we were aiming to cover off most beers in each place so the bus journey from Blackfen to Eltham is a little hazy. Still, we made it to the end of the tour and The Long Pond in Eltham. 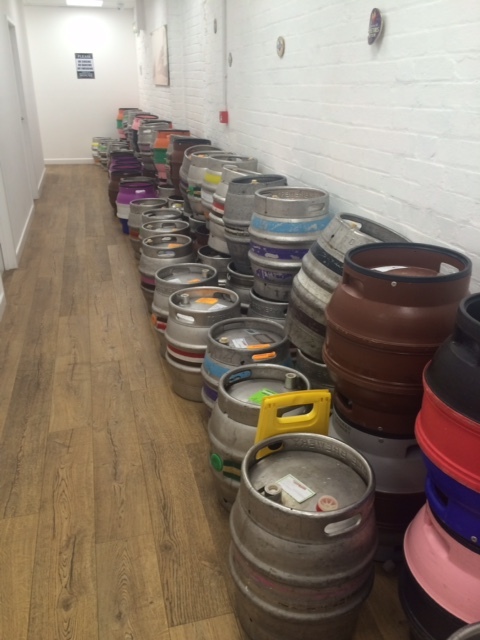 As on a previous visit the sight of all the casks lined up is one to behold. The largest of the four, it has decent back room to compliment the front bar. And the bowls of pork scratchings are magnificent. 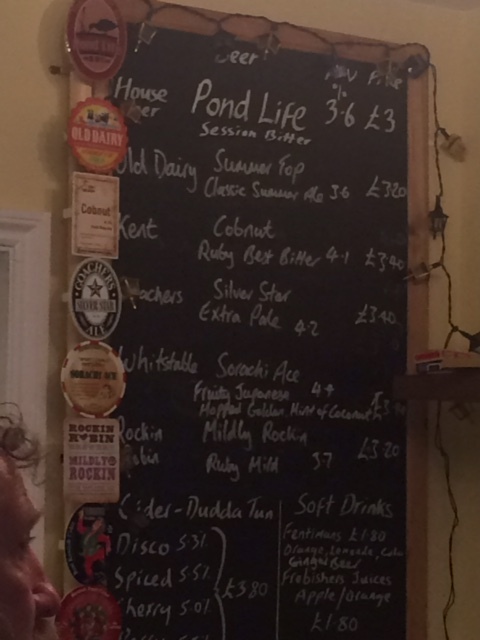 At this point, suitably sozzled (on the Old Dairy, Kent and Goachers, followed by the Whitsable, Rockin Robin and Pond Life), we agreed that micro pubs are indeed A Good Thing. Size does matter as by being small they can fit in to small shop units rather than requiring a big building and so provide a bit of a boost to any local high street or parade of shops. They support smaller, and often fairly local breweries. They provide variety too. We noted that they are either in places not served by a pub or with pretty average places nearby. Finally, they provide a bit of character. Real character, not the bought in identikit and sticking on of a couple of keg beers and claiming to be a ‘craft ale’ pub ‘character’ (maybe we are turning in to grumpy old men as the other half of one of our group claims). The pubs are opened by people who enjoy real ale and that shows. Hussar to that we say, hussar! So, the arrival of Le Bouchon last year did not lead to the ruin of Blackheath as some of the more shrill commentators suggested. 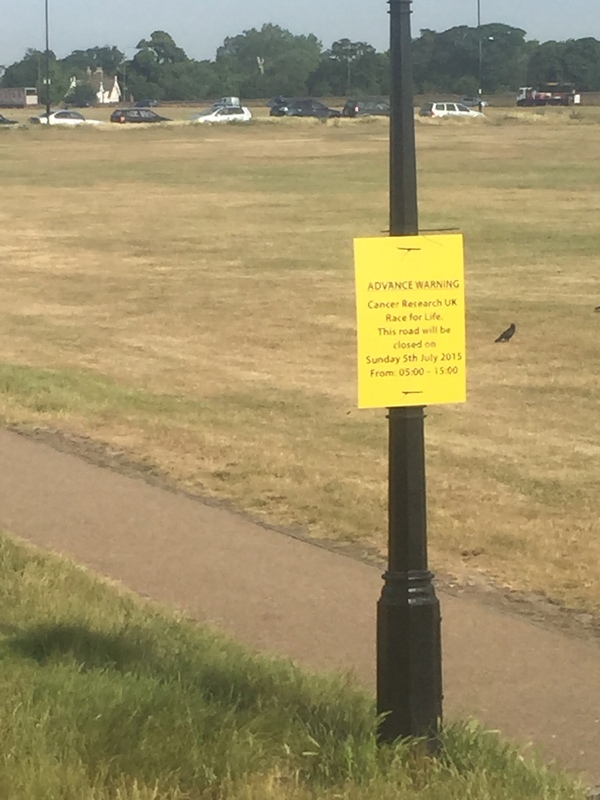 It always seems popular, especially on days such as today (a pleasant early summer’s day but this Radical is slaving over this post! ), bringing a touch of Parisian chic to our little village. No wonder as even if one does not get a much coveted outside table the cool interior with the big open windows is an escape from the bustle of the village, and it is quite er… cool too. Owner JP offers a modest gallic je ne sais quoi when we comment on the success of the of the wine bar, but it is clear to us that it has proved itself a fine addition to the village. So successful that JP was able to do up the upstairs front room (the upstairs was used for seating when it was the Curry Garden) to host small gatherings and wine tasting. In addition LB hosts civilised music nights. Note to self: Must get along to one soon. JP also had the idea to convert the roof to a small terrace as the properties above the bookshop, Pizza Express and Giraffe do. It was intended to utilise this for small events but unfortunately the application has been turned down. We Radicals are baffled by concern about noise and people (especially ‘outsiders’), ruining our quaint village and have made the point before, and do so again: if you choose to live in the centre of a busy village you choose to live with the bustle that goes with that. If you don’t like it, move to a quiet side street. JP has shown with LB that he has created a distinct space that is in keeping with the area and one of the arguments was that the terrace would be “incongruous” to the building and area, despite as we note many on that row have roof gardens that LB merely sought to emulate. But JP has proved his strident critics wrong with Le Bouchon and the best way to support JP and all the good venues in the village is to use them and we Radicals will continue to patronise LB! And we’ll raise a glass, possibly at a future wine tasting (couple of South West France events in June) to that.